These hook-and-loop pressure fasteners have super strong adhesion, holding up to 1 lb per inch. Ideal for indoor or outdoor use, they can be opened and closed repeatedly. 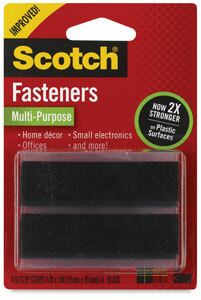 Complete white or black fasteners or hook-and-loop material by the roll available. ® 3M is a registered trademark.® Scotch is a registered trademark of the 3M company. .